They say history is all about myths that are woven around kings and their battles for power with their ilk. In the same vein, modern history is about myths surrounding political leaders and their parties’ struggles for power. Unlike the royal battles, these are mostly fought in the electoral arena and, luckily, the process generates enough data and information to help us bust those myths. This enables us to know, with some confidence, what people — the voters — were actually thinking and how and why they voted the way they did. The PPP has not been able to form a government in Punjab since General Ziaul Haq ousted the party’s first government in July 1977. It won three of the seven national elections after Zia but never a single one in Punjab. In 1988, the PPP came back to power under the leadership of Benazir Bhutto, but Punjab remained with its arch rival, the Islami Jamhoori Ittehad, a large alliance of right-wing parties, with a young Nawaz Sharif as its most enterprising figure. Benazir repeated the feat in the 1993 general elections, but had to handover Punjab to its junior partner, the Pakistan Muslim League - Junejo. The PPP had to give Punjab to Junejo since in return, his party supported Benazir at the centre. 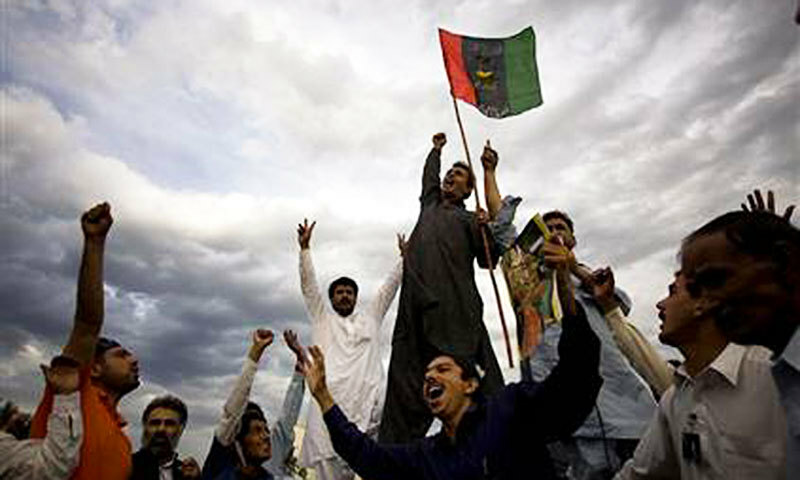 The PPP returned to government following the 2008 elections, but it was the Pakistan Muslim League - Nawaz (PML-N) that occupied Pakistan’s largest province. Does Punjab detest the PPP and has it rejected the party for good? That’s what many believe, with the flip side that ‘PPP is a Sindhi party with no strength in Punjab’. But PPP isn’t really Sindhi. In fact, if it could claim a nationality, it ought to be Punjabi. Have a look below at the provincial break up of the party’s vote bank. Punjab’s share in total votes polled by the PPP in the entire country was a whopping three quarter in the 1970 elections. It has hovered around two-thirds in the number of votes in the next six general elections. In 2008, it dropped to a little over half and went below this mark only in the last elections in 2013, which was the first time that the PPP got more votes in Sindh than it did in Punjab. The catch here is that the PPP has been unable to translate its votes into seats in Punjab. For example, it polled 5.1 million votes in Punjab in 1988 and won 52 seats. But in the next elections, it could win only 14 seats despite having polled 5.35 million votes. The party’s first leader, Zulfikar Ali Bhutto, mobilised the public around the epic slogan of roti, kapra aur makan (food, clothing and shelter). It worked wonders. It wouldn't be wrong to say that the slogan alone was responsible for adding to the much discussed charisma to the personality of the party's founder. But in later stages, the slogan disappeared and was replaced by Jiay Bhutto. The PPP is now known as the party of shaheeds (martyrs) and it loves to invoke these deaths, as it has become its biggest political capital. But does it work? Have people been voting for the PPP out of sympathy or for love for its leaders who have passed? Many critics want us to believe this, but I have my doubts and some supporting facts. If sympathy could win votes for a party, the PPP must have been flooded with it in 2008 when Benazir Bhutto was assassinated days before polling began. The PPP did win the elections, but was it because it rode a huge wave of sympathy? Here is a close examination of how voters behaved. In 2008, the PPP won 9.2 per cent more votes in Khyber Pakhtunkhwa (KP) compared to the previous elections. But so did the Awami National Party (ANP) and the PML-N as their vote tallies rose by 8.3% and 7.9% respectively. In fact, as the Muttahida Majlis-i-Amal (MMA) bubble burst in 2008, every party picked up from its pieces. The religious parties’ alliance lost one million of its 1.4 million votes it won in the 2002 election. PPP’s gain was not disproportionate to those of others, but more importantly, the party’s share of votes in KP in 2008 was still less than what it was in 1988 and 1990. In Punjab, the PPP gained two per cent more votes than it had in 2002. However, in 2002, the party’s share in Punjab increased by 4.4% compared to 1997. This means that the party’s vote bank growth actually shrunk in 2008! Wither sympathy? The party, however, added a hefty 1.5 million votes to its 2002 tally of 2.2 million in Sindh, taking the total to 3.7 million. But its seats in Sindh increased only by four, from 27 to 31. This means that the party polled more votes (or sympathy votes, if you may call them so) only in areas that were already its strongholds. So more votes in Sindh? Yes, but the victory was pyrrhic. Incidentally, the other party in Sindh, the MQM, showed similar growth in these elections. MQM’s votes jumped from 0.93 million in 2002 to an unbelievable 2.53 million in 2008. What triggered the rise? This could be anything but sympathy for the departed leader of its opposing party. The lesson to be learnt here is that people don’t vote out of sympathy or love of a leader. The first PPP government espoused socialist ideals and nationalised not only big industries but also smaller entrepreneurs like floor and rice mills, as well as private educational institutes. This was the main livelihood of many central Punjabis who turned against Zulfikar Ali Bhutto and joined hands with General Zia. Thus began the PPP’s decline in Punjab, which was completed in 2013 when the party was literally wiped off from the province. This is how many analysts describe the PPP’s decline. But did Punjab turn against the PPP in reaction to Bhutto’s policies? 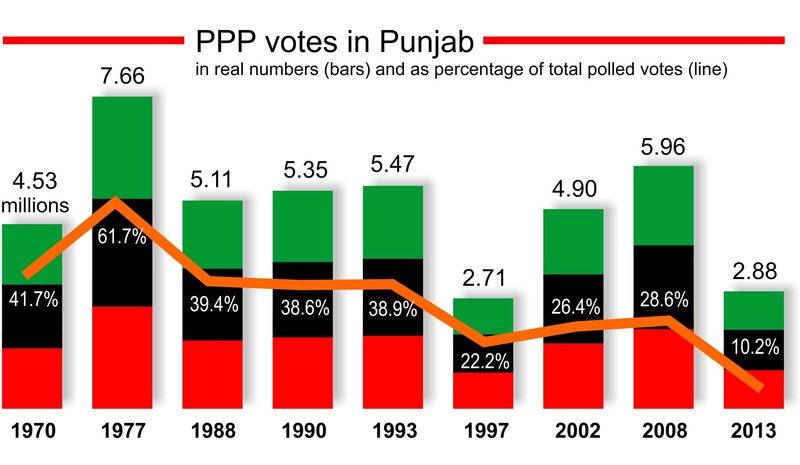 Bhutto’s policies had no impact on the PPP’s votes in Punjab. In the first three elections after General Zia, the party kept getting around five million votes, which was exactly the same as its performance in 1970. Four out of every 10 Punjabi voters remained loyal to the PPP in all of these elections. Despite Bhutto’s nationalisation, other policies, and General Zia’s decade long dreadful regime, Punjab kept depositing its hopes and aspirations in the PPP. The rout came much later, in 1997. Every second PPP voter in Punjab decided to abstain from the electoral process and they never returned with the same enthusiasm afterwards. By 2013, only one in every 10 Punjabi voters was a PPP supporter. Myth 4: Zardari did it! 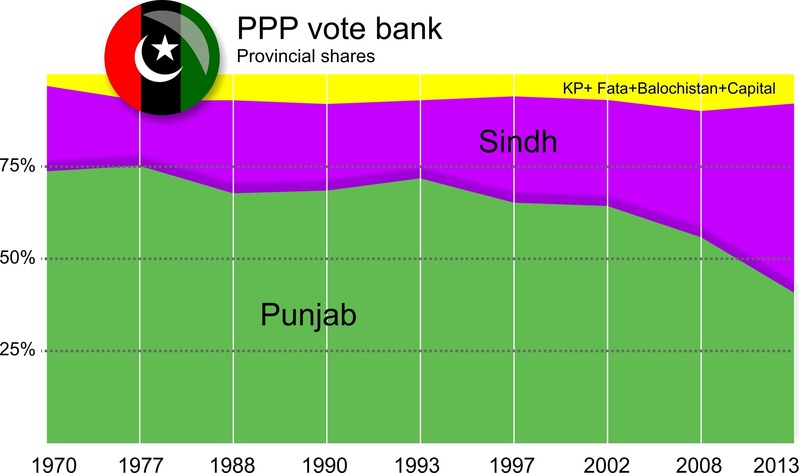 The PPP lost half of its voters in 1997. In the 207-member National Assembly, it had only 18 seats – and not even a single one in Punjab. In the 248-strong Punjab Assembly, the PPP had a humiliating three seats. The die-hard PPP jiyalas rest the entire blame of this disastrous turn on Asif Ali Zardari, the alien in the house of Bhuttos. He was identified as the main character in numerous corruption scandals that plagued Benazir’s government. Zardari was also blamed for spoiling her government’s relations with the party’s own President Leghari. Last but not least, conspiracy theories about Zardari's involvement in the murder of Murtaza Bhutto was the last straw. It is understandable that the jiyalas had to find a scapegoat to salvage Benazir's reputation, as they had entrusted their political ideals in her and were feeling betrayed. But the malice ran deeper than just one or two people or even a corrupt to the core clique. The jiyalas weren’t just let down by their leaders but by the times as well, which is what many of them fail to acknowledge. They fail, or refuse, to see what was reshaping the entire world at that time. Pakistan was no exception and whoever headed the government, the policy dictates were the same. This was a period when the Cold War had come to an end and globalisation was in full throttle. Neo-liberal policies had become the norm. Fiscal policies were being dictated by the International Monetary Fund and the World Bank, and the public sector was shrinking at an alarming speed. Nationalistic protectionism was the new vice and attracting Foreign Direct Investment was the new virtue. Labour unions were now seen as a menace and nationalisation had taken a u-turn to meet its nemesis, privatisation. Amidst these massive global waves, the PPP’s roti, kapra aur makan stood denuded. Even if it hadn’t lost relevance for the people, the old slogans were not in sync with the new paradigms. The jiyalas were destined to be betrayed. 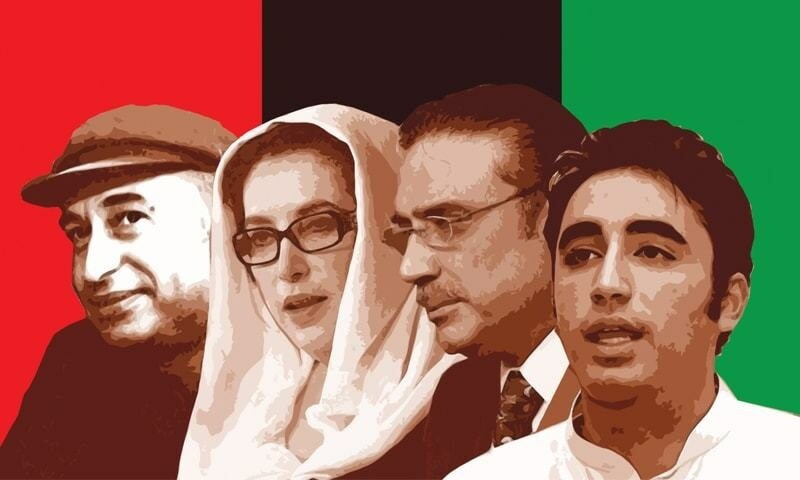 PPP’s rule from 1993 to 1997 wasn’t just an abysmal failure of its governance, it was also the end of the old socialist styled politics, which was the only form of politics the party was known for. It was a time of loss for the party. It didn’t just lose an election in 1997; it also lost the politics it had invented. This one is a developing myth and is gaining strength from the Pakistan Tehreek-i-Insaf’s (PTI) stark failures in meeting its goal of dismantling the PML-N government. The PTI had encroached upon the PPP’s electorate in 2013, but given Imran Khan’s failure, can Bilawal reclaim the lost ground? After the 1997 debacle, the PPP started to fully own the politics of patronage. While the roti, kapra aur makan became more political rhetoric than anything else, the party candidates devoted themselves to competing with their rivals in handling thaana-kutchery for their supporters, electors, and other similar ‘services’ that are the hallmark of their politics. The PPP made gains in 2002 and 2008, but during both these elections, the original champion of patronage politics in Punjab was missing. In 2002, Sharifs were exiled and their local leaders were being hounded by the military government. In 2008, the PML-N had just resumed its activities and was in disarray because party members were unsure about its prospects. PPP played on these weaknesses of its rival and found its way to Islamabad in 2008. But they couldn’t beat the PML-N on its home turf — the Punjab. By 2013, the PML-N was well-settled and no other party was able to match its strength. The PPP now had a competitor in the shape of the PTI for even second position in Punjab and was badly beaten. The PPP could not reinvent its roti, kapra aur makan politics post 1997, nor could it master the politics of patronage in Punjab. All it did was invoke what it called the great sacrifices that its leaders had rendered for the causes of the common people. But it doesn’t work this way. The party will either have to reinvent its own politics or beat the original champion of thaana-kutchery politics at its own game. Both challenges are Herculean but can the PPP meet them? All the numbers and percentages used in this article are for National Assembly elections. What Zardardi did to PPP, General Zia & Musharraf can't able even with all state resources. For sure, whatever number of some particular communities who are left in Pakistan, they will never vote PPP again after ZAB betrayed them so ruthlessly. For the starters, i agree and dis-agree with the comments made in this column because i believe it was not ZAB who brought his party down, the point i disagree on. But i strongly agree with point no. 2, it was indeed Asif Ali Zardari, who crushed the backbone of the PPP. PPP has become Sindhi Party, they have alienated every other ethnic background. Their recent performance, well not so recent as its been a decade of malpractice, corruption, nepotism, and other vices going on unchecked in Sindh, to the point that not a single ruppee is being spent on the infrastructure. We have now reached a point where the people are begging the government to do something about the abysmal condition/state of the Sindh province, a province with one of the largest tax bases and probably the highest potential to develop. Yes PPP won the 2008 election based on sympathy votes, yes it was only due to Benazir dying in a terrorist attack. Had she lived, she would not have won the election. Such an ill-researched opinion driven article. Yes PPP won the 2008 election based on sympathy votes, yes it was only due to Benazir dying in a terrorist attack. Had she lived, she would not have won the election. No, the PPP will not rise again in 2018. Its voter bank has completely been scattered. Those who will vote for PPP are and moslty will be from the province of Sindh with a Sindhi ethnic background. The performance of the PML-N lead government, has been much better compared to that of the 5 years PPP wrought destruction in Pakistan. People of other provinces look in awe at the developments taking place in Punjab, something which Sindh has not been able to emulate, not even 5 percent of it. Based only on the above facts, performance data, PPP is set to loose the 2018 elections, unless they make some bold new claim and are able to sway the crowd. ppp need to change itself to new realities. Above it they need very vocal people like Faisal raza abidi and Babar awan on media. if votes in punjab since 1970 have been hovering around 5 million, is not it the indication that despite of increase of general population to 3.6 folds , ppp is loosing its ground in punjab continuously . It is absurd to compare number of votes PPP got in 1988 with the number of votes it got in 20008 or 2013, the number would obviously increase because the population has been increased by at 35% despite not having any census since 1998. One must look at the ratio of votes against the total number votes where PPP lost completely. I found the selection of words for PML-N highly objectionable, Respected Sir. PPP is also engaged in thana kutchery and patronage politics in Sindh. Secondly, i found attribution of of 1996 PPP failure to washignton consensus highly strange. Washington consensus installed Thatcher and Reagan governments in 1980's however, everywhere in mid nineties liberal parties were winning, examples are UK, USA, Western Europe. Secondly, if you see the graph and see that in last 10 years, the composition of PPP is now more than 50% is comprised of Sindh, you would understand how it has relegated itself to region. In 1993 elections, PPP and PML-J formed the governemnt in Punjab,though Wattoo became Cm with only 18 MPAs. @fkhan They dont need to start new projects in Sindh when they can simply keep harping about how NFC award in inequitable and federal share is too high- they use it as a point to get away with the accountability for the whatever little money they receive. And it works. Hasnt it worked for sixty five years that we couldnt make dams because of lower riparian politics? You know, sometimes i think, that people in lower water regions should be given equal land claim in upper areas so they dont object and honestly, using river water only because underground water isnt sweet is the most unproductive form of agriculture (in terms of country). myth 4 is not a myth - zardari really did it!! How can you say "Bhutto’s policies had no impact on the PPP’s votes in Punjab" when your chart shows an 85% jump in votes from 4.5m in 1970 to 7.6m in 1977? It was Bhutto's policies in Punjab that enabled it to get the highest number of votes ever in an election in Punjab. Bhutto encouraged Punjabis at every turn, using them to replace muhajirs wherever he faced opposition with giving similar privileges to Sindhis who were used to combat muhajirs in Sindh. General Zia merely copied his policies and kept Punjab on his side. PPP is no longer the same as of ZAB or BB, its now a party without a vision. cannot imagine how can a 27 years old boy run a party with dreams to become PM at this tender age. This is only seen in kingdom where the son takes on the seat of his father at any age. It looks ridiculous to watch senior & seasoned politicians clap and nod heads behind Bilawal who is just a lad. PPP is a political force without any future at the national level for atleast ten years as it is impossible for them to garner any support in Punjab that can get them majority in the NA. Even in Sindh if viable and sustainable option is available to the masses PPP will lose their grip. All is due to their pathetic rule for last eight years of governing Sindh. What have they done other than looting and plundering, see what they have turned Karachi into, look at the roads, hospitals, schools and other government institutions. They have done nothing than fleecing the people of this province in the name of Sacrifices for Democracy (B.S.) and Bhutto (who himself have not done anything great to boast about other then giving this ignoramus and ignorant nation the empty slogan of Roti-Kapra-Makan). These are shameless brash and brazen lot who are good for nothing. Please do not blame everything on Zardari. Please remember the 90s when PPP under the late Benazir crippled the economy and made crime flourish in Sindh. Conditions were exactly the same when Zardari came into power in 2013, which allowed all forms of corruption to flourish. Tale of PPP since its inception narrated by by Tahir Mehdi is somewhat satisfactory. It is true that PPP could not achieve desired results with regard to gain votes and public support during past elections in punjab. In 1993 PPP made govt in punjab with the support of pml junejo then it has been failed. Majority of people of central and north punjab is educated working aboard due to this they have brought experience of foreign to their areas, which definitely enhanced morale of public. If we turn to see while late ZAB time, his poor policies privatization to nationalization created difference and gave it birth to hate due to taking established industries or schools made by owners from their sweet to nationalization shows advisers of ZAB were poor. Now we come to the tenure since shaheed BB came into power, his former president husband Mr. Zardari remained headache for her and party, caused defamation for party resulting PPP has been wiped out from country except interior sindh. This is very unfortunate that a federal party, which was established by ZA Bhutto, is today called a Sindhi Party. 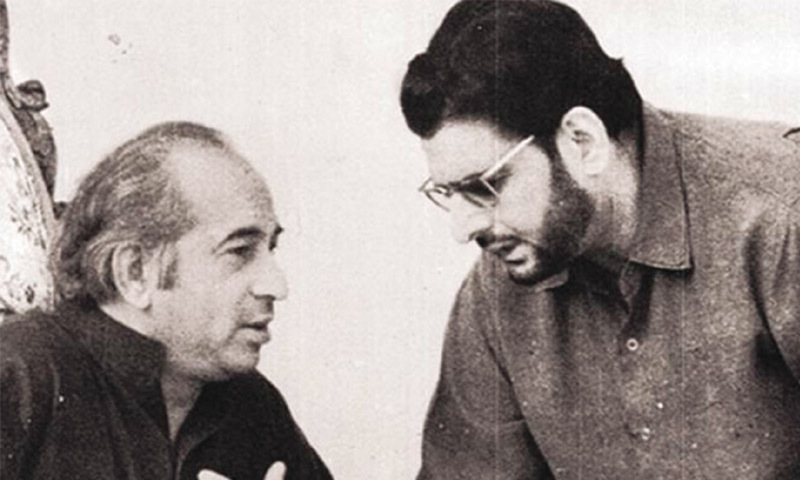 In my opinion, it is the victory of GM Sayed's vision and other nationalist parties, who have been trying to give this impression that Pakistan is only meant for Punjabis and to add to their argument, the Bhutto family has been executed only because they were Sindhis. I still believe that PPP, though it lost its influence in Punjab, KPK and has been relegated to Sindh only, it is still a symbol of federalism and connecting force between the federating units. Calling it a Sindhi party will be a dangerous move and will weaken the foundations of the Federal State, therefore, whether you like it or not, better to accept it as a federal party instead of making a provincial party. It is a good article. Let met make a couple of points. Despite use of state and its all resources against it during the 1988 elections, PPP won 55 out of 99 National Assembly seats from Punjab. State was unashamedly used to deprive PPP of victory in provincial assembly. Anti PPP use of state continues. in 2008 PPP actually lost seats due to BB's assassination. If BB was alive PPP would have won at least 25 more seats. Assassination worked against PPP. Punjab still has strong worker and voter base in Punjab. Bilawal has to reactivate them. Due to terrorists' threat PPP has failed to hold a public meeting in Punjab since BB's Shahdat which allowed space to PTI. If Bilawal comes out the workers will be reactivated. PTI and PML-N are basically two faces of same coin and cater same constituencies. PPP has its own constituency with its own issues which will remain with PPP. If Bilawal reactivates workers than PP will get 25-30 seats from Punjab in 2018. Oh, this article is a masterpiece. Thanks for digging deep and bringing the hard facts to light. Well written. I hope the jialas are listening . You are right regarding the distant past but it has become only popular in Sindh in the last few years. Let's see if Bilawal Zardari can revive the party in Punjab or not. BIBI had an anti dictator struggle, QAaltaf had mohajir rights to fight for and Imran had a long political journey to reach where he's now. But I just never understood the rise and attraction of Nawaz Sharif. I mean what did he have to offer other than a family name. Can the writer shed some light on this for his next article. thank god, your article sir has digressed from established narrative and has offered a fresh take on vicissitude of PPPP. PPP comeback is inevitable. Only Political party who is clear in his views and have clear Ideological Foundation. Only Political Party who see directly in the eyes of the Monster of extremism. Only Political party whose leaders sacrificed their lives.